The Collective Community Art Center is proud to present wanderingthroughwords – Works of Matthew Hoffman from December 18, 2018 – February 17, 2019. Matthew Hoffman is a Chicago based artist and designer. Known internationally for his project, “You Are Beautiful”, Matthew Hoffman creates inspirational and uplifting, word-based artwork. His messages are both positive and simple, yet beautifully crafted. "There's enough negativity and ambiguity in the world. There's no reason to add to it." - Matthew Hoffman. The Lafayette Arts & Cultural Resources Department would like to wish City Administrator Gary Klaphake all the best as he retires from 20 years of service to our community. Mr. Klaphake understood the potential for the arts to be a part of building both economic and social vitality in a community and has generously supported the expansion of the arts in Lafayette. 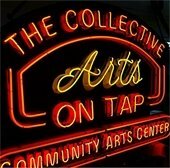 The new “Arts on Tap” sign gracing the Collective Community Arts Center was installed by the Lafayette Urban Renewal Authority and the Arts, with some assistance from the Arts & Cultural Resources Department, to honor Mr. Klaphake’s vision for Old Town Lafayette and all he did to transform Public Road into a wonderful destination. Best of luck on your retirement, Mr. Klaphake! 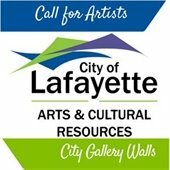 Deadline for submission 3/1/19 The City of Lafayette Arts and Cultural Resources Department invites Colorado artists and arts organizations to submit work to be displayed in one of three city facilities. Artwork will be selected by a panel of city staff. Work will typically hang for a two-month time period. Artists showing their work at the Library or Senior Services may request permission to hold a reception. 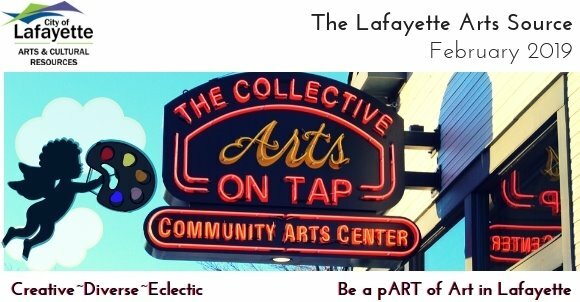 Lafayette has a substantial art community, and a dynamic citywide arts program. This is a no-fee, juried exhibition. Apply online. We are re-checking the pulse of the creative community so we can all strengthen the web of support for the state’s visual artists. The online survey is open now through February 28th. Auditions Open for FAME Jr.
February 4. (8th-12th grade) $405 The Arts HUB is auditioning for its Spring high school production of FAME JR. Rehearsals are Mondays and Wednesdays from 6:30 PM to 8:00 PM. Register here. www.artunder.org. February 1. 7 pm. tickets $15 Robert Johnson with Expeditions led by Lafayette's own, Pete Lewis and Clare Church. Robert Johnson is a veteran singer and entertainer. February 22. 7 pm. Sheela Bringi , Hindustani classical and devotional musician, incorporates influences from American blues and jazz with the Indian music she learned as a child from her parents and classically trained musicians in India. February 28. 6:30-8 pm. tickets $15-$20 Ben Markley Quartet with NYC saxophonist extraordinaire, Joel Frahm! Also with Jim White on drums, Marty Keeney on bass, and Ben on Piano. Fresh arrangements and compositions played by some of the best jazz players in the country! February 2. 7-9 pm. tickets $15 Ascent Jazz Ensemble featuring Lafayette's saxophonist, Grant Larson! All original compositions. TGIF Social Music Jam w/Special Guests! February 1, 4:30-5:15 pm. Fridays. FREE monthly music jam for children through adults with special needs, led by Board Certified Music Therapist Amanda Bryant. This month our special guests will be a hip-hop dance troupe. Come to Make music, Make friends, Listen, Play, Dance- your choice! Sensory friendly accommodations made as needed. Caregiver/ Parent must also attend. February 22, 7pm on. Fridays. FREE chance to perform on our stage! Bring your instruments, come sing, or just come to listen and applaud. Open to everyone in the CMA community. Refreshments available for sale. February 1. 10:00 am. 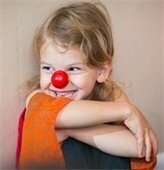 Join Miss Kathe from The Dance Front for a sample of her “First Dance” class for children ages 2-4. Fun with puppets, streamers, songs, and of course, dancing! Parent participation encouraged. Class included with Museum admission. February 14 and 28. 3:00 pm. Philosophy for kids? Yes! Come join us for story time and activities with our friends from Grey Havens Philosophy. All ages are welcome to participate! Program included with Museum admission. Colorado Music Festival & Center for Musical Arts, 200 East Baseline Rd. June 17-21. 9 am-3 pm. 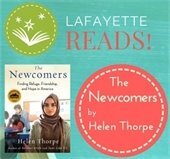 For children entering 2nd-6th grades. Registration is now open with an early bird discount until March 15th! limit 12 participants. Camp held in Old Town Lafayette at the Starkey Building, 309 S Public Rd. June 21. 2 pm. Last day performance at the Mary Miller Theater, 300 E Simpson St.
February 8. 4:30-8:30 pm. Evan Cantor and his wife Robin will entertain us with their wonderful acoustic music featuring romantic jazz and soul. Enjoy Cantor's unique oil paintings along with our two featured pARTiculars member jewelers, Barb Amador and Karen Edgerly. pARTiculars is a cooperative gallery and teaching studio owned and operated by local artists who proudly showcase more than 40 Colorado artists in various fine arts media. We are committed to excellence in art and art education and look to promote artistic passion in artists, students and the community. 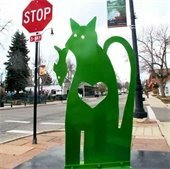 The 2018 Art on the Street sculptures line Public Road in Old Town Lafayette. Take a stroll or view the website to enjoy the sculptures. Copyright © 2019 City of Lafayette, CO. All Rights Reserved.